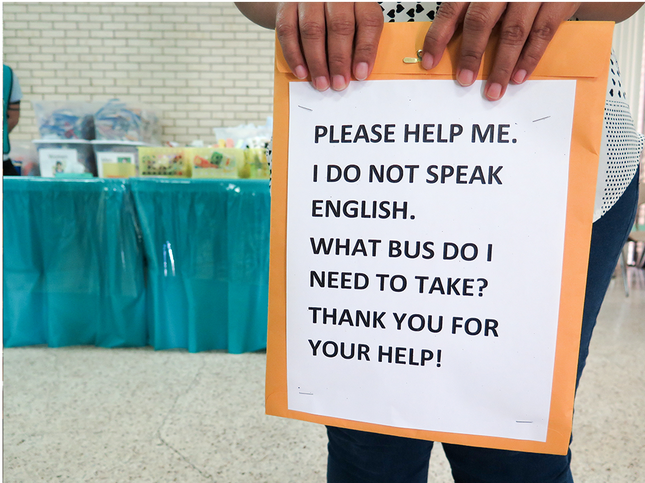 A Central American immigrant seeking asylum crossed the border with her son in 2017. The American court system bewilders her, she says. She first spoke with NPR's Lulu Garcia-Navarro a year ago on a barren dirt road with her then 17-year-old son, while Garcia-Navarro was with Border patrol agents near Roma, Texas who were on the lookout for undocumented migrants crossing into the U.S. illegally. Under the broiling sun, the young woman told the story of how she'd fled her country because of threats by one of the most feared gangs in El Salvador, the Mara Salvatrucha, better known as MS-13. "They wanted to take him [my son]. I had to hide him at a friend's house ... They wanted him to join them. And they threatened that, if he didn't, they would kill both of us," she recounted, crying. It was a familiar story. Since at least 2012, there has been a massive exodus from Central America as families flee gang violence looking for safety in the U.S. For many Central Americans, the only path to legally immigrate is to ask for asylum, which this mother did for her and her son. After being processed, she was released to her family in Los Angeles with an ankle bracelet and a countdown to a court date that would decide if she and her son could both stay in the U.S.
She, however, faces a daunting challenge: One thing that often determines whether someone like her gets to stay in this country or gets deported — a lawyer. She does not have one. She says she's had trouble finding free legal counsel, and she can't afford a private attorney, which costs thousands of dollars. NPR has been following her story for the past year to see how President Trump's immigration policies are affecting her and son. The Trump administration has been trying to change asylum laws. Attorney General Jeff Sessions has said courts are overwhelmed with fraudulent claims by Central Americans "who fear generalized violence, crime, personal vendettas, or a lack of job prospects." Last month at a café, our asylum seeker described her past year. She said she had been checking in with Immigration and Customs Enforcement, or ICE, as she is required to do. But she isn't allowed to work, so money has been tight. Her son had enrolled in school but he didn't understand English and was being bullied so he dropped out. She said she was afraid that without a lawyer for her upcoming court date in February, she and her son will get deported to El Salvador — where she added her son could be killed by the gangs. Judy London, directing attorney for the Public Counsel's Immigrants' Rights Project in Los Angeles, says this mom is right to be worried. London says an asylum seeker is five times more likely to win a case for asylum if they have legal counsel. "So much depends on whether you have a lawyer and then whether you have a good lawyer," London says. But there are simply not enough lawyers to go around. Immigration courts are unique in that defendants do not have a right to government-funded public defenders. Immigrants have to either privately get a lawyer or rely on charities like London's to get help. Many of these immigrants often don't speak English and even if they did, the asylum process is extremely complex and confusing. "It was clear to us seeing people come into our office starting several years ago the scope of this crisis. And had it been labeled what is — which is a refugee crisis — you might have seen a different treatment by our legal system, and more compassion and more resources flow from our legal system," London says. London says Central Americans have few options to navigate the process. For our asylum seeker, the clock was ticking and as the court date approached she still didn't have a lawyer and she seemed confused about where she needed to go and what she needed to do. ICE provides very little guidance on these matters. On the day of her hearing, we sent a producer to see what happened. Our asylum seeker showed up on time. But she went to the wrong court house. It was a small mistake that ended in disaster. By the time she found the right court, it was too late. The judge had deemed her a no-show and issued a deportation order against her and her son. That same day she tried to get the judge to hear her case later in the afternoon, but the judge said no. To reopen her case will require paperwork and legal help. The day after her court date, she told NPR over the phone that ICE had already been in touch. She's hoping to find a lawyer to appeal to reopen her case. Just a year ago she was about to get on a bus to what she hoped would be a new life. "My dream for this country is that my son can be safe and go to school and that I can get a job to support him," she'd said back then. But now the reality is she and her son could be deported at anytime. NPR's Jennifer Velez contributed content to this piece. NPR's Digital News intern Asia Simone Burns produced this story for the Web.